Glen Jacobs more popularly known as Kane was born on April 26, 1967 on a US Air Force stationed in Madrid, Spain due to his parents being in the army. Despite being born away from his parent’s homeland, he spent much of his young life in the United States. While attending Quincy University in Illinois, Jacobs played basketball where he earned a basketball scholarship to go to Northeast Missouri State University. During the 1988 – 1989 seasons he was dubbed as an NCAA All-Star and was listed in the Truman State University media group as holding the record for highest field goal percentage for a single season and other records at the school which he still holds to this day. His success in the sport continued but he decided to switch so he could play college football instead. He eventually earned all-conference honors as an offensive liner man and at the end of his studies, graduated with a Bachelors Degree in English. He then worked as a junior high substitute teacher in St. Louis, Missouri. Glen Jacobs is best known for his career as an American professional wrestler and actor who goes by the stage name Kane. He started out by working on independent circuits going and by 1992 went by the name Angus King. He continued until he won the USWA (United States Wrestling Association) Heavyweight Championship as Doomsday and the SMW (Smoky Mountain Wrestling) Tag team Championship as Unabomb as a member of the ‘Dynamic Duo.’ Jacobs then made his first appearance in the WWF’s (World Wrestling Federations) Survivor Series in 1993 as Black Knight and then was re-introduced as Dr. Isaac Yankem DDs, Jerry Lawlers private dentist. He even stood in for Jerry Lawlers sometimes to wrestle Bret Hart. He sported this gimmick regularly until May 1996 and just made a few appearances after. Jacobs was repackaged as Kane in October of 1997 as the younger half-brother of The Undertaker and son of Paul Bearer. On October 5th of the same year, Jacob re-debuted in WWF at ‘Bad blood: In Your House’ which Shawn Michaels won against the Undertaker. Over the following year, The Undertaker and Kane would embark on a marketed feud and Jacobs won his first match as Kane against Mankind at the Survivor Series. 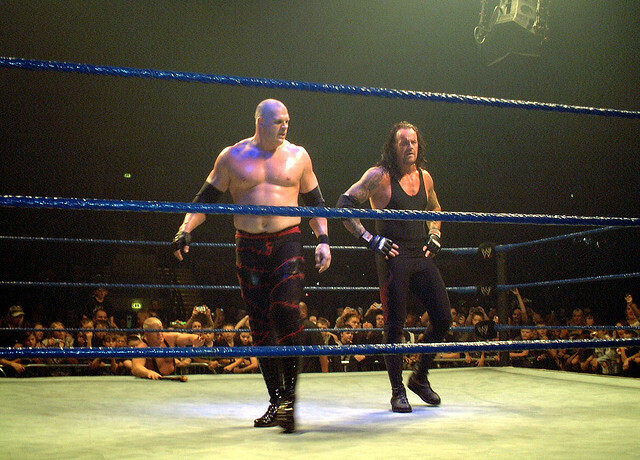 Kane would later form an alliance with the Undertaker and eliminated a record number 11 wrestlers. He eventually became the runner-up after Steve Austin eliminated him. On March 25 of 2002 when the WWF was separated into two brands; Smackdown and RAW, Kane was officially drafted to RAW. On October 17, 2005 Kane returned to WWE television and won an eighteen-man battle royal. After winning he was featured on an internet poll to decide who would receive a shot at the WWE Championship at Taboo Tuesday. On October 13, Kane moved to Smackdown for the first time where he reunited with the Undertaker as the Brothers of Destruction to defeat Montel Vontavious Porter (MVP and Mr. Kennedy. Afterwards they did several gimmick matches. Jacobs still continues to wrestle as Kane to this point as part of the ECW (Extreme Championship Wrestling). He made his film debut in the first WWE Studios production entitled See No Evil as ‘Jacob Goodnight’ which was released on May 19, 2006. He appeared again in an episode of Smallville entitled Combat playing as a Phantom Zone criminal from another world named Titan who faces off against Clark Kent. Glen Jacob is Jewish and a member of the Free State Project; an internet based political movement advocating for 20,000 persons to move to New Hampshire in order to make the state a stronghold for Libertarian ideals. He writes frequently about his beliefs on his blog at Adventures of Citizens. On August 23, 1995 Jacobs got married to Maurisa Goins with who he has two step daughters.